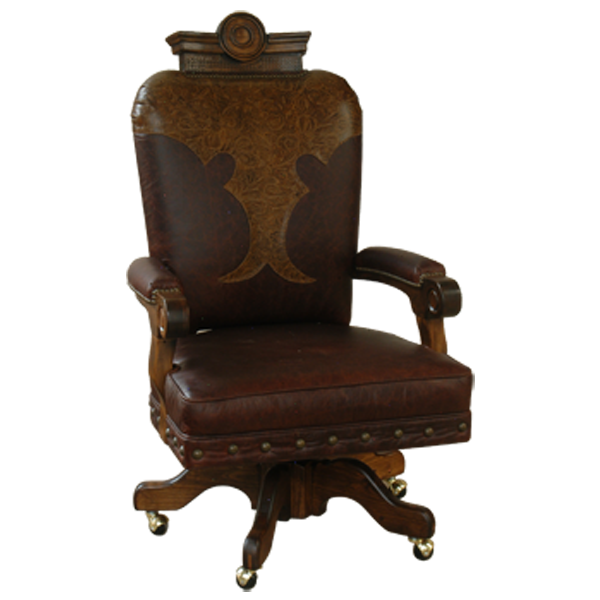 This handcrafted, Western style, office chair features a solid wood crest on the top of the seat back. We can customize this office chair by hand carving your ranch brand, your initials, or your own personal design on the crest. The office chair has a waist shaped, rectangular, seat back, and it is upholstered with wine colored, full grain leather. The seat back is complemented with a large, dramatic, Western cut design, and the Western cut design is upholstered in contrasting, light brown, embossed, full grain leather. The seat cushion and part of the armrest are upholstered in matching, wine colored, full grain leather. The armrest are beautifully finished and end in a scroll design. The base of the seat cushion is hand tacked with large, gilt nails, and the remaining part of the upholstery is hand tacked with small, gilt nails. The leather upholstery is double stitched together for extra strength and durability. Resting on solid wood, quadripartite, revolving supports, the office chair has caster wheels for extra mobility. It is 100% customizable.